This set of photos was taken on two occasions, the first on July 13, 2015 and the second on July 15, 2015. The times on both were soon after 5 AM. The location was in a temporary entrance to a very nice hotel in the Georgetown section of Washington DC. They were renovating the lobby at the time. The "Take It!" 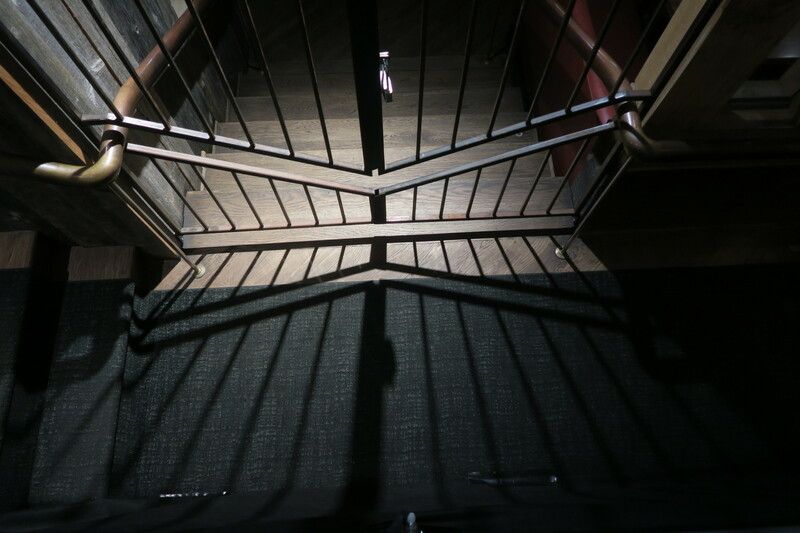 came from using a temporary access to the lobby which via an elevated ramp allowed me to pass in front of and above this well lit gate that closed off a bar in the hotel. 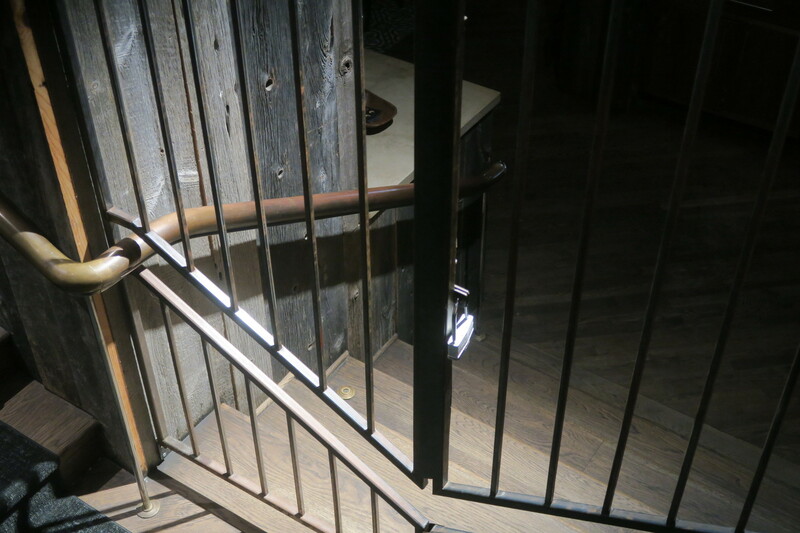 After numerous pass by's I took notice of the unique shadow that was cast from the overhead lighting through the gate on to the floor. Nothing spectacular but the setting taken in as a whole framed up as a pleasant photo. After passing by it numerous times after the initial photo I took notice of the design and saw that when each half of the gate was opened, the design of the grill work was such that the railings could fit through openings to accommodate a full opening of the gate and leave the railings functional. This kind of ingenuity is a marvel to discover on display. The After Take: I shared this set of photos with my informal consultants group and found they enjoyed the planning that went into the making of these gates along with me. Here is hoping you too discover a touch of artistry in something that has a primary function that may be mundane. I really like how the stairs fade off into blackness. The shadows in this photo give off an almost haunting vibe. It is creepy but very cool nonetheless. The first photo is very cool! That has to be the most ominous staircase in that town. You take very beautiful pictures Mr. Bruce. I very much enjoyed this set of pictures. Interesting how the wood on the walls looks so worn and old, yet the wood on the stairs looks very new. Are the stairs wood, or is that linoleum or something like it? They must have it locked so people don't go in there, although personally, I wouldn't step down there with it SOOO dark.